Malihabad: He prefers calling himself a ‘cipher’ though he has been conferred upon a Padma Shri besides a host of national and international honours. 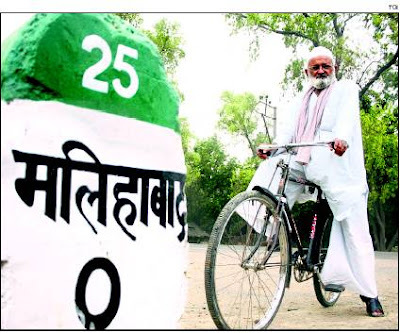 The ‘zero’ milestone in Malihabad is the landmark of his unique mango orchard. And, it was a duck that drove him to meddle with mangoes. Cipher, it seems, is connected with Haji Kaleem Ullah Khan, the father of mango grafting. “I scored zero in English following which I left school and developed interest in mangoes,” he said. So, he randomly picked up seven varieties of mango saplings for grafting. In three years, the experiment yielded mangoes of seven flavours on a single tree. Five decades of passion delivered five new varieties of mangoes and a number of mango trees bearing fruits of different flavours, shapes, sizes and aroma. The best one is a mango tree having 357 varieties of mangoes. The latest addition to his 22-acre orchard is a ‘slim’ looking mango likely to be named after actor Aishwarya Rai Bachchan. “The seeds of this obsession were sown in 1950s when a friend narrated the story of crossbred roses. That very moment the thought of experimenting with mangoes came to my mind,” he recalled. Acclaimed world over for his ‘madness’, Khan misses recognition of his worth on the home front. “This happened with me from the day one. No one bothered to laud me for my sevenin-one wonder,” said Kaleem. Even nature opposed and washed his efforts away. The patch of land which contained the premier trees turned into a marshland during the floods of 1960. “My daughters are the only admirers in the family,” he said. Obsessed with mangoes, he shares that mangoes have given him sleepless nights, indicating that his appetite for the ‘king of fruits’ is much above taste. “Mango has traits similar to those in humans,” he philosophised. Explaining his point, he said, “human race is unique because despite coming from the same parents- Adam and Eve- no two individuals (even identical twins) are the same. So is the case with mangoes. Seeds made from fruit of a specific mango tree, will germinate into a different fruit come what may. This uniqueness of mango, evident in the veins of its leaves, inspires me constantly.” Strangely, Khan has no personal favourites. Citing an example, he said: “When I had to send a mango tree to former President KR Narayanan, the Kaleem inside me felt awful knowing that the roots of the tree will have to be cut to facilitate transportation. Has life changed after the Padma Shri? Showing the holes and a patch on his kurta, Kaleem said: “Jab ek per phaldaar ho jata hai toh uski daalein jhuk jati hai (when a tree bears fruits, its branches bow).” In fact, he rides a bicycle to commute between his orchard and house, despite owning a four-wheeler. “I get to meet people when I move on a cycle, which is not possible with a car,” he humbly reasoned. hi navras these are articles are pick up from newspaper write new about malihabad.